← School Counselor: Your efforts are destroying young minds and a national treasure, our public schools! If implemented fully, the reforms you promote will have crippling effects on student learning, teacher quality, and public education in general. I believe your involvement in the current educational “reform” movement began with good intentions. However, it seems to me that your educational philosophies, particularly your enthusiasm for the use of high-stakes testing, are dangerously misguided. If implemented fully, the reforms you promote will have crippling effects on student learning, teacher quality, and public education in general. Testing companies have one primary goal: to make profit. The National Board of Educational Testing and Public Policy at Boston College estimates that today’s testing market is worth anywhere from $400 to $700 million. What’s interesting is that many people who scream that testing is necessary to hold teachers accountable are the ones who also claim that teachers are greedy and overpaid. What they fail to understand is that districts pay testing companies millions with taxpayer dollars–so these complainers themselves are helping line the pockets of corporations. Money districts spend on testing could be much better spent on materials, personnel, and programs that truly help students achieve. High-stakes tests send students the message that tests are more important than actual learning and that if something isn’t on a test it’s not worth learning. Standardized testing generally assesses students in reading and math; other subjects are largely ignored, which sends the message that those subjects are somehow less important. Overemphasis on testing results in a narrowing of the curriculum; art, music, and elective programs are cut because they do not help improve test scores. Administering one test to all students promotes a one-size-fits-all educational climate that ignores differences in learning styles and limits curricula. Promoting expansion of standardized testing will lead to a nationally-dictated curriculum (think Common Core–and realize that David Coleman, its chief architect, is the President of the College Board) that dictates what students should be learning and when and limits schools’ freedom to design and articulate course structure. For example, some schools teach American Literature in 10th grade; some teach it in 12th. Testing needs to reflect students’ age, and ultimately, schools will have to redesign programs of studies to match tests. The number of instructional days devoted to testing has grown exponentially–one NY teacher estimates that 40 of her 180 instructional days are devoted to testing and test prep. Tests are designed by corporations, not teachers, and are often field-testedon students, during instructional time, who are used as guinea pigs–rather than on students who participate in paid focus groups. Teachers and administrators are not allowed to see the test on test day, nor are students permitted to discuss the tests after they’ve finished taking them. Such secrecy gives testing companies too much power and authority, and hinders efforts by teachers and parents to understand what the students are actually being tested on. Such secrecy helps testing companies reuse test questions by selling them for profit. Tests are scored by testing companies–mostly by computers–and students, parents, and teachers are at the mercy of a companies with little (if any) transparency whose primary interests are profits. Errors in scoring: recently, Pearson made egregious errors in scoring that kept thousands of NY students out of a gifted program. Also, McGraw-Hill‘s errors and delay in scoring the NY Regents exam left students wondering whether or not they would be able to graduate high school this year. Problems on test-day: after this year’s exam, AP students reported that a problem on the AB Calculus exam caused TI-89 calculators to freeze during the test. Also, students in four states were kicked offline during a high-stakes standardized test. If high-stakes tests are used solely to evaluate teachers and have no impact on students’ grades–and unless they are a requirement for graduation–students have no incentive to try their best or take the test seriously. Many students (particularly at the elementary level) experience test anxiety, and some even make themselves physically sick because of the importance placed on these tests by school personnel (because test results determine whether or not teachers keep their jobs, whether schools get funding, etc.). Students learn to dread tests and negatively associate content with meaningless tests. The importance that’s placed on high-stakes tests sends the message to children that test scores are the only measure of their intelligence–which is damaging to a child’s self-worth. Testing and test prep take time away from creative, ruminative, enriching learning experiences in the classroom. Testing eliminates choice in reading and writing exercises, as students are forced to write in a methodical, robotic (usually five-paragraph-essay) format. Students ask “is this going to be on the test?” and if not, they don’t see the value in learning it. Students dread school, as it becomes a depersonalized, clinical environment. In short, they learn for the wrong reasons and lose the joy of learning for the sake of learning. Test scores are largely affected by factors beyond teachers’ control: attendance, health factors, the extent to which a child’s family values and stresses academics, class size, students with special needs, length of time students have been in district/how frequently their family moves, etc. It is inherently unfair to evaluate some teachers (those who teach tested grades and subjects like English and math) and not others; this will breed resentment among teachers and discourage aspiring teachers from entering the profession. Evaluating teachers using student test scores will create resentment among teachers: who gets the gifted students? who gets the lower-achieving students? who gets small class sizes? Scheduling alone will pit teachers against one another. Teachers’ creative licenses will be stifled, and they will be forced to “teach to the test” so students know what to expect on high-stakes tests. Student scores can be affected by teachers in disciplines other than those being tested; for example, students with the same math teacher might have two different chemistry teacher, and those chemistry teachers might teach math differently. Same goes for language arts; students with the same English teacher might have two different history teachers–one of whom requires more writing than the other. There’s not enough research to show that measuring teacher effectiveness using test scores even works; in fact, there’s much research to show the opposite. Schools generally have no control or authority over what students do outside of schools. Students who abuse substances, for example, stifle their own ability to focus, to think clearly and analytically, and to study. However, test score-based teacher evaluation ignores such issues. Some students, regardless of the quality and efforts of the teacher in the front of the room, are simply unwilling to learn. Test consistency: a 150 (theoretical score on a theoretical test) on a 3rd grade test and a 150 on a 4th grade often don’t mean the same thing; it is virtually impossible to create tests that sequentially measure the same level of learning on a consistent basis. This is especially true for language arts tests, which are largely subjective. The margin of error on VAMs is large; teachers who earn high ratings one year can earn poor ratings the following year, or vice versa (which suggests what we already know: that class composition affects scores greatly). Damian Betebenner, SGP (an alternative to the VAM) designer, cautions that his system is not meant to evaluate teachers/help districts make personnel decisions and notes that it does not provide an explanation for the cause of growth. 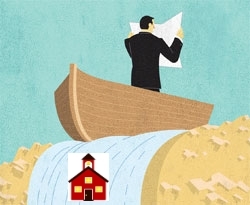 Ultimately, is impossible to determine teachers’ effectiveness by using a system that is inherently flawed, imprecise, and counterproductive to the efforts of educators. I’m sad to say that as extensive as this list of concerns might seem, it is still incomplete. While assessment will (and should) always be an important part of the educational process, high-stakes standardized tests are damaging to children, to teachers, and to the educational environment we all must work to preserve. This entry was posted in Corporate Education Reform, End High Stakes Testing, Standardized Testing and tagged CCSS, Common Core State Standards, Common Core Tests, Corporate Education Reform, Edreform, End High Stakes Testing, Gates House of Cards, Gates House of Cards Action, High Stakes Testing, NCLB, PARCC, Public Education, Race to the Top, SBAC, Teachers' Letters to Bill Gates, The Bill and Melinda Gates Foundation. Bookmark the permalink.